Do you want to film your art creation and need a sturdy mount to hold you your ipad and shoot fantastic videos above your hands? 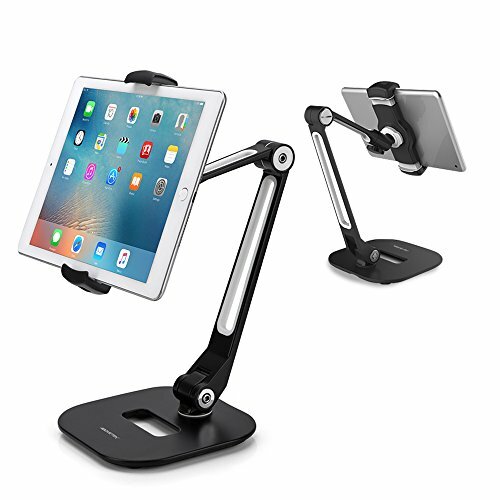 This long arm tablet mount stand can serve you all the needs of using a tablet at home and business environment. Nowadays, tech gadgets especially tablets have become essential in our daily life. We work, play, watch, read, shop, type and do business all on our tablets. These interactions with your tech gadgets will be much more enhanced and facilitated with this universal tablet holder. Sturdy & heavy-duty metal base and arm form a highly rigid structure to sustain various tablets and phones with up to 1.3 feet elevation for better posture and eyelevel view. Multi-task as a dual-screen display on office desktop and retail business Point of Sale register, etc.